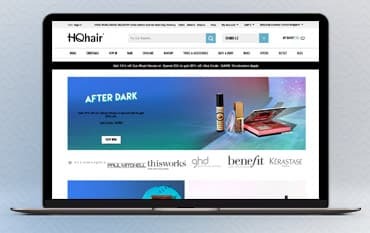 Where do I use my HQhair voucher code? Browse NetVoucherCodes for HQ Hair deals. Copy a code and click through to the HQ Hair website. Once you’re finished shopping, view your basket. Under your items you’ll see ‘Got a discount code? Enter it here’ box. Paste your code into here and click ‘Add’ to enjoy instant savings on your order. "Sign up to the mailing list today to receive the latest news and enjoy access to exclusive offers, all delivered straight to your inbox." If makeup and beauty is your passion and you simply can’t resist buying goodies to fill up your dressing table with, HQ Hair is your go-to online shop! Filled with top branded products including the likes of Elemis, Paul Mitchell, Benefit, GHD, St Tropez and many more; shop skincare products, fragrances, hair tools, cosmetics and much more all in one, organised place. Fulfill your passion for beauty with a colourful palette of lipstick or eyeshadows which are certain to make your eyes & lips pop. If you’re more into haircare or skin cosmetics, perhaps you’ll be more interested in cleansers, moisturising lotions, anti-ageing creams, self-tanning products or hair conditioning treatments. When it comes to beauty, there is a whole platform of new and exciting products to try, so don’t be afraid to venture out of your comfort zone as you may just find something you love. Whether you’re on the quest to experiment with your look or find something more effective for your skincare regime, the HQ website is a great place to begin your search. Find exactly what you’re looking for and filter your search by product and brand to tailor your search towards exactly what you need, at a price you can afford. There is no need to go forking out a fortune on new beauty products. Whether it be makeup or hair accessories, ensure you check out the offers section before purchasing full priced items as you may just find something you’re looking for. Shopping with a Discount Code could too help you cut down the costs on those all-important beauty essentials which you’re craving. Browse NetVoucherCodes listings for HQHair today and watch the total price drop before your eyes. If you like to keep up to date with the latest trends when it comes to beauty and hair care, HQ Hair is home to the savviest electrical goodies! For some people, traditional skincare products including scrubs and exfoliants are just not enough to satisfy their needs. It’s for this reason HQ Hair are proud stockists of the wonderful world of Vibra-Sonic Skincare Brushes, Foreo Luna Facial Cleansers and the Foreo Iris Eye Massager. Browse the electric skincare range today if you dare to venture from the traditional to the ultra-savvy! There is never a wrong time to stock up on your makeup essentials, whether you’re in search for a bold lip, sultry smokey eye or a simple cover up, you’re sure to find some goodies in the HQHair Makeup section. Sporting a wide variety of luxuries brands including the likes of Benefit, Illamasqua, NYX, Stila and many more. If you’re wanting to add to your collection or experiment with new looks and try out the latest trends whether it’s contouring, strobing, baking or lining, the HQHair Specialist buyers have picked out products especially to cater to your needs and to keep you up to date with the latest craze. Add goodies to your online shopping bag and shop with a discount code and see your total price drop before your eyes. If you love to experiment with your hair, you’re probably not new to the idea of mixing it up and creating different styles with your look! However, it can sometimes be tough to come up with ideas if you don’t have enough of the right tools to supply your creative side. If you’re yearning to try new styles with your hair but don’t want to fork out a heap of cash on a variety of different curling tongs, irons and electricals, The GHD Platinum Styler will be perfect for you. Use your HQ Hair Promotional Code courtesy of NetVoucherCodes and make an investment you won’t regret. Combining three functions for curling, straightening and styling, the GHD Platinum Styler features everything you need in one, easy to use Wand! It also leaves your hair ultra shiny, with reduced hair breakage. If you’re wanting to make a return, you will need to contact the HQHair Customer Service team with your order number and explain which item you’re returning and why. You can return unwanted products within 14 days of delivery providing they’re unopened and in perfect condition. With HQ Hair, you’re free to experiment and be bold with your beauty when it comes to your makeup and hairstyles! Uncover a vast array of innovative and colourful products for your hair, body and face at HQ Hair and don’t allow yourself to be stuck in the same old routine. Switch up your style or give your look a revamp at HQ Hair. If you’re looking to wow your family and friends and begin to feel comfortable in your own skin, HQ Hair is your one-stop shop. Use an HQhair discount code courtesy of NetVoucherCodes and treat yourself to a selection of makeup sets, hair treatments, skin care products, nail varnishes and accessories for less. Start browsing today and you’re sure to find everything you need at HQ Hair Online.